WOW! 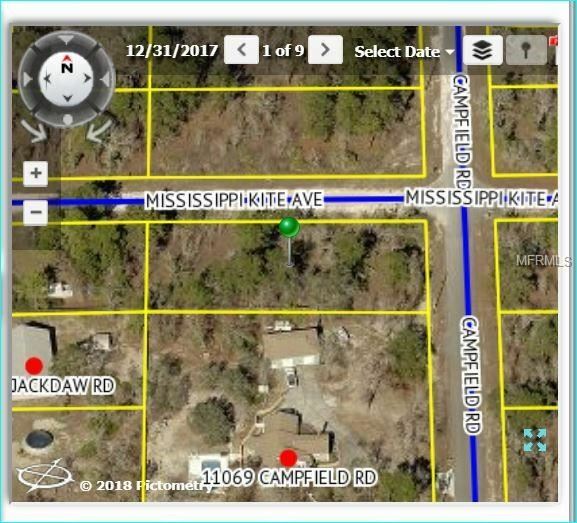 A BEAUTIFUL CORNER LOT ON CAMP FIELD ROAD AND MISSISSIPPI KITE AVE. CAMP FIELD ROAD IS A PAVED ROAD. BUILD YOUR DREAM HOME ON THIS LOT. JUST MINUTES FROM US 19 AND ROUTE 50 WITH LOTS OF SHOPPING AND CLOSE TO THE SUN COAST PARKWAY. US 19 RIGHT ON HEXAM LEFT CAMPFIELD ROAD TO THE CORNER OF MISSISSIPPI KITE. SIGN ON TREE. The approximate monthly Principal & Interest payment for this property would be $92. This payment is based on a 30-year loan at a fixed rate of 4.12 % with a down payment of $1,590. Actual lender interest rates and loan programs may vary.